March is National Bed Month and it serves as a great reminder of importance of a good bed for healthy sleep. It also coincides with spring and the time we look to freshen our homes. With this in mind, Furniture 123 is introducing some fabulous new additions to its beds and bedroom store. These great beds combine style and functionality and there’s something for everyone, including the kids. The best part is everything is available from the online store now! 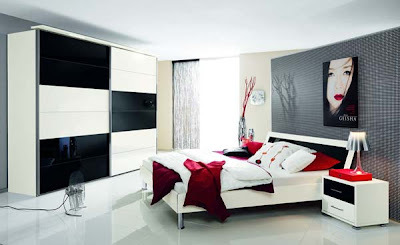 The Mack range of bedroom furniture offers a contemporary design which combines practicality and stunning good looks. The pieces in the range are minimal with bold contrasting panelling. The elegant white and polished black headboard complements the contemporary aesthetic beautifully and sits at an angle for added comfort. The Mack Bed in White and Black is available in 4 sizes has a quality slatted base that will provide fantastic mattress support. The Venice Brown Upholstered Bed is a smart yet affordable choice if you are looking to update a tired bedroom with a sleek, contemporary look. Upholstered in deep brown tones, with stitched details on the tall headboard, it also features sprung slats for comfortable mattress support, and it is perfectly completed with low profile legs. It is available in 5 sizes and comes with free next day delivery. Beau White is a hand built bedroom collection, designed with a hint of Italian detailing and a sense of a bygone era. Meticulously manufactured in solid pine and modern materials, these pieces possess a truly elegant look. Once painted, they are lightly distressed by hand for a smooth patina feel and an antique look. The Beau White High Foot End Bed also features ornate crests and scrolls that ooze romantic charm. It has a slatted base for firm mattress support and is available in 4 sizes. The Minnie kid's bedroom range is a colourful collection sure to spark your little one's imagination. Crafted from solid Scandinavian pine, with a child-friendly, lacquer finish, this bed is long-lasting, sturdy and supportive. Cleverly designed with practicality in mind, the space-saving Minnie Natural Midsleeper Bed features a pull out desk, 4 drawer chest and bookcase. It also has a tall safety barrier and exceeds European safety standards and requirements. This great kid’s bed is available with or without a Continental Single (90cm x 200cm) superior sprung interior mattress. National Bed Month is an initiative of the Sleep Council and is held every year. This year their focus is on sleep as the "NEW ALL ROUND MIRACLE CURE!... According to latest research, a comfortable uninterrupted seven or eight hours sleep each night can relieve stress, slow down the ageing process, boost your mood, your physical and mental performance and cure a wide range of aches and pains." What more of an excuse do you need to buy a new bed? Pin It Now!